Please don't remove information on this page without discussion. This subpage gives an overview of the various places which are being mentioned as possible birthplace for Bodhidharma. It also provides webpages and other sources which mention these possible birthplaces. This overview gives interested readers the chance to evaluate these possibilities. Various possible birthplaces for Bodhidharma are mentioned in a variety of sources. They come down to either South India or Central Asia. 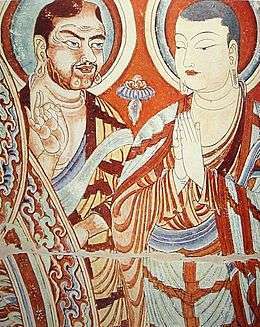 Blue-eyed Central Asian Buddhist monk, with an East Asian colleague, Tarim Basin, 9th-10th century. A "persistent tradition" sees Bodhidharma as "the third son of a Pallavine king from Kanchipuram", in Kanchipuram district in the Indian state of Tamil Nadu, South-South East India. Another Indian traditions describes him as being born in the historic city of Vanchi, capital of the ancient Chera Kingdom. The location of Vanchi is generally considered at Mahodayapuram (also called Thiru-vanchi-kulam) near the ancient port city of Muziris, municipality Kodungallur, state of Kerala, South West India. A third Indian possibility is Kochi. Kochi is part of the Ernakulam district in the state of Kerala, South-South West India. A fourth Indian Possibility is Nagarjunakonda. Sri Lanka is also mentioned as a possible birthplace. All of these Central Asian regions were at the time Iranian language speaking, with their Buddhist forms following the Greco-Buddhist traditions then at their height under the Iranian-language speaking Buddhist Central Asian Kushan Empire, also known as Bactria. (See Silk Road transmission of Buddhism and Persian Buddhism.) Determining the specific modern 'nationality' of origin of the Bodhidharma legends within this then common-cultural, Iranian language region, is somewhat anachronistic. Except for Persia, the listed Central Asian possibilities are not explicitly mentioned in the principal sources for Bodhidharma's biography, but are more or less frequently mentioned on the web and in written documents. Dàoxuān's (Tao-hsuan) Further Biographies of Eminent Monks (7th century CE). The earliest text mentioning Bodhidharma is The Record of the Buddhist Monasteries of Luoyang (洛陽伽藍記 Luòyáng Qiélánjì) which is compiled in 547 by Yáng Xuànzhī (Yang-Hsuan-chih 楊衒之), a writer and translator of Mahāyāna Buddhist texts into the Chinese language. the Sramana Bodhidharma from the western regions, originally a man from Persia"
The teacher of the Dharma, who came from South India in the Western Regions, the third son of a great Brahman king"
The teacher of the Dharma, who came from South India in the Western Regions, the third son of a great Brahman king. In the 7th-century historical work Further Biographies of Eminent Monks (續高僧傳 Xù gāosēng zhuàn), Dàoxuān (道宣; 596–667) possibly drew on Tanlin's preface as a basic source, but made several significant additions. [A] Brahman monk from South India"
The same account appears in the Ch'üan fa pao chi, an 8th-century text which narrates the traditional Chán-lineage. It is ultimately impossible to reconstruct any original or accurate biography of the man whose life serves as the original trace of his hagiography - where "trace" is a term from Jacques Derrida meaning the beginningless beginning of a phenomenon, the imagined but always intellectually unattainable origin. Hence any such attempt by modern biographers to reconstruct a definitive account of Bodhidharma's life is both doomed to failure and potentially no different in intent from the hagiographical efforts of premodern writers"
Yanagida ascribes great historical value to the witness of the disciple T'an-lin, but at the same time acknowledges the presence of "many puzzles in the biography of Bodhidharma". Given the present state of the sources, he considers it impossible to compile a reliable account of Bodhidharma's life. In the description of the Louyang temple, Bodhidharma is called a Persian. Given the ambiguity of geographical references in writings of this period, such a statement should not be taken too seriously". And when Tao-hsuan speaks of origins from South Indian Brahman stock, it is not clear whether he is referring to roots in nobility or to India in general as the land of the Brahmans. Kanchipuram is a city and a municipality in Kanchipuram district in the Indian state of Tamil Nadu, South-South East India. Kanchipuram was a major seat of Tamil, Sanskrit, and Telugu learning as well as an important place of pilgrimage for Buddhists, Jains and Hindus. Buddhist scholars such as Dignaga, Buddhaghosa, and Dhammapala lived here. Kanchipuram was the capital of the Pallavas rulers from the 7th to 9th centuries. From the 4th to the 9th century CE the Pallavas ruled over south-east India. They had maritime contacts with far-off destinations such as China, Siam and Fiji, through their chief Port Mamallapuram. According to Chinese records, Bodhidharma was born in a kingdom of South India. Documents published just after Tang dynasty (ending in 907) describe that the name of the Kingdom is expressed with two Chinese characters ‟香至‟. There are four states which are called as South India. No historical record is found in which state the 香至 is located. At this time when interest in Zen Buddhism is increasing throughout the world, the birthplace of this pivotal master would be a great concern. Not only scholars but also those interested in Buddhism would welcome this missing piece of information where in India is the Kingdom 香至. The Chinese name 香至 means “fragrance extreme”. At the time of Tang dynasty, it is likely that 香至 is pronounced as Kang-zhi. In 2007 by examining various documents, the author happened to come across the identification of 香至 to be Kanchipuram, an old capital town in the state Tamil-Nadu. Further investigation revealed that Kanchi means „a radiant jewel‟ or „a luxury belt with jewels‟, and puram means a town or a state in the sense of earlier times. Thus, it is understood that the ‟香至-Kingdom‟ corresponds to the old capital „Kanchipuram‟, located at a distance about eighty kilometers from the city Chennai in South India. It was a capital of Pallava Dynasty at the time when Bodhidharma was living. Currently, it is a sacred town of Hinduism. Historical remains related to Buddhism found in that region are very limited in number. In the Chennai Museum, however, one can see an image of standing Buddha (more than 2m height) excavated in a Hindu temple of Kanchipuram in the early times of 20th century. This image of dignity is reminiscent of the glorious times when Buddhism had flourished in this region where it was discovered. Unfortunately, Tsutomu Kambe is thrifty in further information on his sources. The "various documents" in which "the author happened to come across the identification of 香至 to be Kanchipuram" are not being identified. So, according to Tsutomu Kambe the Pallava kingdom is a speculation on "South Indian king". The Pallava dynasty and Kancipuram are also often mentioned in modern written sources. Persistent tradition tells us that the 'first Zen patriarch' Bodhidharma (ca. 470–532) was an Indian monk, the son of South Indian ruler, a king of Kanchipuram, and that he appeared one day at the southern Chinese port city of Canton around 520 A.D. whence he traveled to see Emperor Wu of the Liang dynasty. This tradition points to Bodhidharma as a member of the ruling class of the South Indian dynasty of the Pallavas, the contemporary of Skandavarman IV or Nandivarman I. It is well known that Kanchipuram, the Pallava capital, was one of the most important strongholds of Indian Buddhism. An ancient Prakrit charter (the British Museum plates of Queen Carudevi) mentions among very early Pallavas two kings called Buddhavarman and Buddhayankura, obviously Buddhists, belonging probably to the 4th century A.D. Another Buddhavarman belongs to ca. 540–560 A.D. The well-known commentator Buddhaghosa lived in Kanchipuram probably in late 5th century A.D. The Chinese Buddhist pilgrim Hsian Tsang who visited South India in the 7th century A.D. tells us that there were about a hundred Buddhist monasteries in the city with more than 10,000 monks, and he also refers to Kanchih-pu-lo as the birth-place of Dharmapala, the reputed author of treatises on etymology, logic and Buddhist metaphysics. Undoubtedly, the Zen tradition of a South Indian Buddhist monk coming possibly from Kanchipuram to China in the early 6th century may be regarded as trustworthy. If Bodhidharma was a Tamil-speaking South Indian (whether Brahmin (sic), as one version has it, or a prince), the popular saying of one hand producing no sound might have belonged to his linguistic competence. Zvelebil mentions "persistent tradition", but does not give a reference to the source for Kanchipuram. Zvelebil calls the Kanchipuram-origin "possibly", not certain. Zvelebil makes clear that Kanchipuram was an important Buddhist centre in the 4th to 7th century. This does not prove that Bodhidharma came from Kanchipuram. The reverse is also possible: since Kanchipuram was an important Buddhist centre, it seemed likely to Chinese authors that Bodhidharma came from this place. According to Yanagida and McRae, the traditions about Bodhidharma are doubtful. Vanchi, capital of the ancient chera kingdom was located near the ancient port city of Muziris. Muziris was an ancient sea-port in Southwestern India on the Periyar River 3.2 km from its mouth. In a flood of the Periyar in 1341 CE, Muziris was destroyed and the centre of commerce was shifted to other areas. Modern state of Kerala, which forms most of the ancient Chera kingdom is very much known for preserving its ancient martial traditions like Kalarippayattu. No written sources are known which mention Muziris, Kodungallar to be the birthplace of Bodhidharma. Kochi is part of the Ernakulam district in the state of Kerala, South-South West India. Kochi is often called by the name Ernakulam, which refers to the western part of the mainland Kochi. In 1102 CE, after the fall of the Kulasekhara Empire, Kochi became the seat of the Kingdom of Cochin, which traced its lineage to the Kulasekhara Empire. The King of Kochi had authority over the region encompassing the present city of Kochi and adjoining areas. Kochi rose to significance as a trading centre after the port at Kodungallur (Cranganore) was destroyed by massive flooding of the river Periyar in 1341. One webpage has been given as reference for Kanchipuram and the Pallavine dynasty, or was found by a Google-search. It does not give references to original source-material which would date this tradition to a historical source. No written sources are known which mention Kochi to be the birthplace of Bodhidharma. Nagarjunakonda is "a historical Buddhist town" in Andhra Pradesh, South-East India. Two web sources are being mentioned for Nagarjunakonda. One written sources makes a passing mention of Nagarjunakonda to be the birthplace of Bodhidharma. At Nagarjunakonda (not far, it should be mentioned from Bodhidharma' s possible birthplace), two Pratykea Buddhas pull "their shawls up over their ears["]. So, according to Gridley, Nagarjunakonda is not Bodhidharma's birthplace. 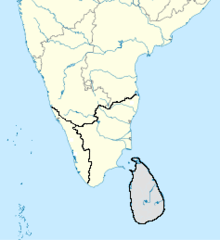 Sri Lanka is an independent state located south-east of the Indian sub-continent. Its history has been closely linked to that of the Indian sub-continent. Theravada-buddhism was brought to Sri Lanka from India. Sri Lanka is inhabited by a variety of ethnic and cultural diverse groups. No written sources are known which mention Sri Lanka to be the birthplace of Bodhidharma. Blue-eyed Central Asian monk teaching East-Asian monk. Bezeklik, Eastern Tarim Basin, China, 9th–10th century. The "western regions" refers to North-west India and the Sassanid Empire, including Persia, Afghanistan and Iraq. North-west India was controlled by the Seleucid Empire until 305 BCE, the Maurya Empire, the Kushan Empire, and the Sassanid Empire. Tradition has Bodhidharma depicted as a "blue-eyed Barbarian". Due to Caucasian migrations, blue eyes were not uncommon in Central Asia. This depiction may refer to the Silk Road transmission of Buddhism from north-west India and Central Asia to China. But it may also refer to Central Asia, including the Tarim Basin, the Kingdom of Khotan, and the Tocharians. 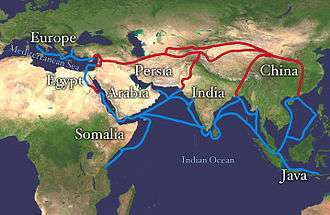 Silk Road extending from Europe through Egypt, Somalia, the Arabian Peninsula, Iran, Afghanistan, Central Asia, Pakistan, India, Bangladesh, Java-Indonesia, and Vietnam until it reaches China. The land routes are red, and the water routes are blue. Via the Silk Road Buddhism was brought over land to China from north-west India, a stronghold of Mahayana-Buddhism. The Silk Road transmission of Buddhism is most commonly thought to have started in the late 2nd or the 1st century CE. The first documented translation efforts by Buddhist monks in China (all foreigners) were in the 2nd century CE, possibly as a consequence of the expansion of the Kushan Empire into the Chinese territory of the Tarim Basin. From the 4th century onward, with Faxian's pilgrimage to India (395–414), and later Xuanzang (629–644), Chinese pilgrims too started to travel by themselves to northern India, their source of Buddhism, in order to get improved access to original scriptures. The Silk Road transmission of Buddhism began to decline around the 7th century with the rise of Islam in Central Asia. 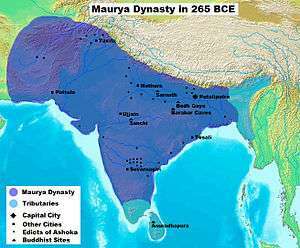 The Maurya Empire was an empire in ancient India, ruled by the Mauryan dynasty from 321 to 185 BC. The Empire was founded in 322 BC by Chandragupta Maurya, who had overthrown the Nanda Dynasty and rapidly expanded his power westwards across central and western India taking advantage of the disruptions of local powers in the wake of the withdrawal westward by Alexander the Great's Greek and Persian armies. By 320 BC the empire had fully occupied Northwestern India, defeating and conquering the satraps left by Alexander. 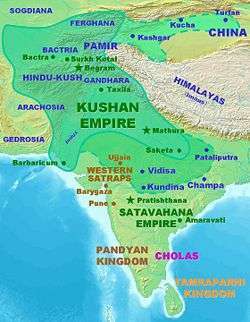 The Empire was expanded into India's central and southern regions by the emperors Chandragupta and Bindusara, but it excluded a small portion of unexplored tribal and forested regions near Kalinga (modern Orissa), till it was conquered by Ashoka. Its decline began 60 years after Ashoka's rule ended, and it dissolved in 185 BC with the foundation of the Shunga dynasty in Magadha. Ashoka's embrace of Buddhism has been said to have been the foundation of the reign of social and political peace and non-violence across all of India. Ashoka sponsored the spreading of Buddhist ideals into Sri Lanka, Southeast Asia, West Asia and Mediterranean Europe. The Arthashastra and the Edicts of Ashoka are the primary sources of written records of Mauryan times. The Lion Capital of Ashoka at Sarnath, has been made the national emblem of India. In the middle of the 2nd century CE, the Kushan empire under king Kaniṣka expanded into Central Asia and went as far as taking control of Kashgar, Khotan and Yarkand, in the Tarim Basin, modern Xinjiang. As a consequence, cultural exchanges greatly increased, and Central Asian Buddhist missionaries became active shortly after in the Chinese capital cities of Loyang and sometimes Nanjing, where they particularly distinguished themselves by their translation work. They promoted both Hīnayāna and Mahāyāna scriptures. Thirty-seven of these early translators of Buddhist texts are known. The empire declined from the 3rd century and fell to the Sassanid Empire and Gupta Empire. Persian, present-day Iran, at the time of Bodhidharma was part of the Sassanid Empire, which succeeded the Kushan Empire in this region. It was the last pre-Islamic Persian Empire, ruled by the Sasanian Dynasty from AD 224 to AD 651. The Sassanid era, during Late Antiquity, is considered to have been one of Persia's/Iran's most important and influential historical periods. The Sassanids' cultural influence extended far beyond the empire's territorial borders, reaching as far as Western Europe, Africa, China and India. Most Japanese scholars and Buddhist monks think he is a Persian. In Japan, even in popular books and internet articles he is introduced as a Persian. Those who want to have a definite lineage of Zen Buddhism tend to stick to Indic origin theory. But this theory is highly dubious. For there is no room for doubt that Mahāyāna Buddhism including Zen was developed in Central Asia and there is no evidence to show its close link to South India. Tojo sees similarities between the wanderings of Bodhidharma and "Persian sufis (wandering dervishes)", and the martial arts and monk-warriors in the Šaolin temple, and "Believers of Roman Mithraism [who] were mainly military people". According to Jorgensen, the mentioning by Yáng Xuànzhī of Bodhidharma as Persian is mistaken, since Sassanian was not Buddhist. Johnston supposes that Yáng Xuànzhī mistook the name of the south-Indian Pallava dynasty for the name of the Sassanian Pahlava dynasty. Afghanistan is a landlocked country located in the centre of Asia, forming South Asia, Central Asia and the Middle East. The territory that now forms Afghanistan has been an ancient focal point of the Silk Road and human migration. Archaeologists have found evidence of human habitation from as far back as 50,000 BC. Urban civilization may have begun in the area as early as 3,000 to 2,000 BC. The Seleucid Empire controlled the area until 305 BCE when they gave much of it to the Indian Maurya Empire as part of an alliance treaty. The Mauryans brought Buddhism from India and controlled the area south of the Hindu Kush until about 185 BCE when they were overthrown. Their decline began 60 years after Ashoka's rule ended, leading to the Hellenistic reconquest of the region by the Greco-Bactrians. No web sources are known which mention Afghanistan to be the birth-country of Bodhidharma. Some written sources are known which mention Afghanistan to be the birth-country of Bodhidharma. 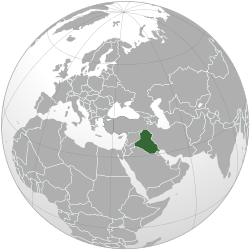 Iraq is a country in Western Asia. Two major rivers, the Tigris and Euphrates, run through the center of Iraq, flowing from northwest to southeast. Historically, Iraq was known in Europe by the Greek toponym 'Mesopotamia' (Land between the rivers). Iraq has been home to continuous successive civilizations since the 6th millennium BC. The region between the Tigris and Euphrates rivers is often referred to as the cradle of civilization and the birthplace of writing, law and the wheel. No web sources are known which mention Iraq to be the birth-country of Bodhidharma. No written sources are known which mention Iraq to be the birth-country of Bodhidharma. 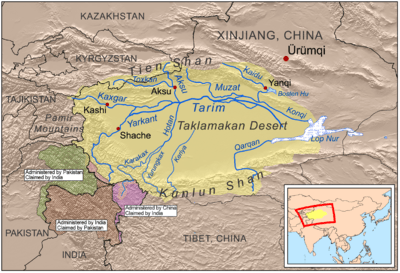 The Tarim Basin is a large endorheic basin occupying an area of about 906,500 km2 (350,000 sq mi). It is located in the Xinjiang Uyghur Autonomous Region in China's far west. The ancient Buddhist Kingdom of Khotan was located in the Tarim Basin. 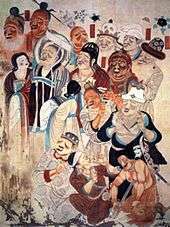 It played a role in the Silk Road transmission of Buddhism to China. Part of the population of Khotan may have been blue-eyed, due to Caucasian migrations. The Kingdom of Khotan was an ancient Buddhist kingdom that was located on the branch of the Silk Road that ran along the southern edge of the Taklamakan Desert in the Tarim basin. The area lies in present-day Xinjiang, China. The first habitants of the area were Indo-Europeans (either Persian or Indian) from the west, and Chinese from the east. 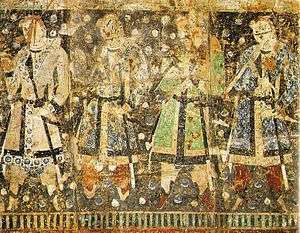 The Tocharians were speakers of Tocharian languages in the Tarim Basin (modern Xinjiang, China). The Indo-European language of the Tocharians was supplanted by the Turkic languages of the Uyghur tribes about 800 AD. The Tarim Basin mummies (1800 BC) have been found in the same general geographical area as the Tocharian texts and frescoes from the Tarim Basin (3rd to 9th centuries AD), and are both connected to an Indo-European origin and point to Caucasoid types with light eyes and hair color. However it is unknown whether the mummies and frescoes are connected. 1 2 Zvelebil 1987, p. 125. 1 2 3 Dumoulin 2005, pp. 85–90. 1 2 Dumoulin 2005, p. 88. 1 2 3 4 McRae 2003, p. 26. 1 2 3 4 Dumoulin 2005, p. 89. ↑ Dumoulin 2005, p. 87. ↑ Yampolski 2013, p. 7. 1 2 McRae 2003, p. 24. ↑ Dumoulin 2005, pp. 89–90. 1 2 Dumoulin 2005, p. 90. 1 2 Kambe & Year unknown. ↑ Zvelebil 1987, pp. 125–126. ↑ Gridley 1994, p. 107. 1 2 Soothill and Hodous 1995. ↑ Tojo 2010, p. 9. ↑ Tojo 2010, p. 10. ↑ Tojo 2010, p. 12. ↑ Tojo 2010, p. 12-13. ↑ Jorgensen 2000, p. 159. ↑ Ruhe 2005, p. 76. ↑ Carter 2010, p. 112. ↑ Rong Xinjiang (2004), Land Route or Sea Route? Commentary on the Study of the Paths of Transmission and Areas in which Buddhism Was Disseminated during the Han Period, tr. by Xiuqin Zhou, Sino-Platonic Papers 144, pp. 26–27. ↑ Lin Kok Collection Archived October 26, 2011, at the Wayback Machine. ↑ The Hindu: "Bodhidharma portrayal wrong in film"
↑ Japan-i, The rotund and staring Daruma Doll Archived November 19, 2011, at the Wayback Machine. ↑ The Muslim Times (2012), Bodhidharma’s story: The Indian monk who introduced martial arts to Shaolin temple Archived June 23, 2012, at the Wayback Machine. ↑ Asiawind, "Damo was an ethnic Persian from South Asia"